You’ve been teaching for a while. You’ve done the Delta or the Trinity Diploma. 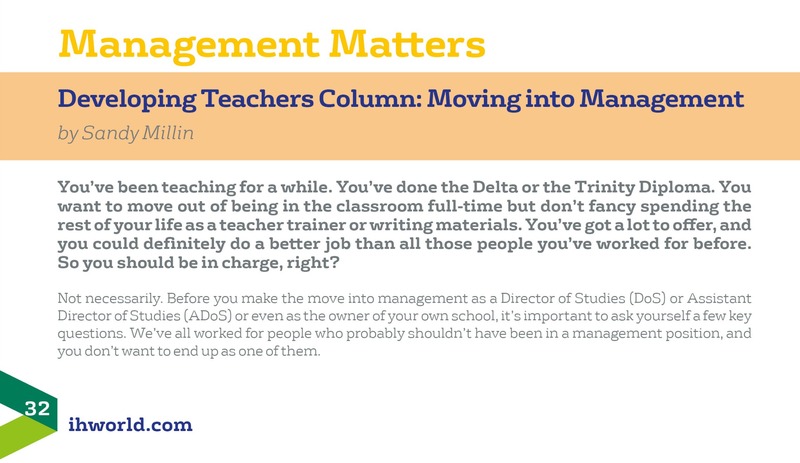 You want to move out of being in the classroom full-time but don’t fancy spending the rest of your life as a teacher trainer or writing materials. You’ve got a lot to offer, and you could definitely do a better job than all those people you’ve worked for before. So you should be in charge, right? Not necessarily. Before you make the move into management as a Director of Studies (DoS) or Assistant Director of Studies (ADoS) or even as the owner of your own school, it’s important to ask yourself a few key questions. We’ve all worked for people who probably shouldn’t have been in a management position, and you don’t want to end up as one of them. Do you have enough experience? 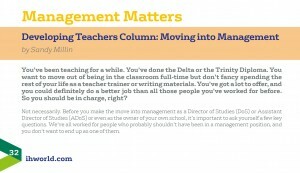 While there are some schemes in the corporate world which train would-be managers with no experience of the day-to-day routine of the people they’re managing, for an academic manager I think it’s important for the teachers you’re working with to know you understand the challenges of their job. If you’ve never had a difficult teen class, worked split shifts or travelled for an hour to get to a company only to find the class has been cancelled, how can you truly empathize with your team? Of course, that doesn’t mean you have to have exactly the same range of experience as them, but if you’ve only ever taught adult classes from pre-intermediate to upper intermediate, it’s probably a good idea to broaden your range before you step out of the classroom. Do you have the right kind of experience? This may sound like common sense, but teaching in a tiny school in one non-English speaking country does not necessarily help you to work as a Director of Studies in a big school in a completely different country. Again, that doesn’t mean that you can’t take that job, but think carefully about how easy it will be to transfer your experience over to your new role. You could try for a Senior Teacher, Coordinator or Assistant Director of Studies (ADoS) role first in order to gain greater insight into what management involves and to broaden your experience. Are you an effective communicator? As far as I’m concerned, at least 90% of being a good manager is being a good communicator. You need to keep your team up-to-date with what is happening in the school so that they don’t miss out on key information they need to do their jobs effectively. On the other hand, you also need to know what not to communicate. Your team doesn’t need to know absolutely everything. Remember, too, that communication from management should include positives, not just negatives. It’s important to praise your team for the things that they’re doing well, so that they don’t only hear from you when there’s a problem. Are you good at admin? Most of the rest of being a manager involves organising yourself and other people. If this is difficult for you, observe your managers carefully to see what kind of strategies they use to manage their time. Start to experiment with them yourself and find out what works for you. It’s also important to be able to complete administration tasks promptly and efficiently. If you don’t complete your register straight after the lesson, the teacher who has to cover your class at the last minute suffers. If you can’t finish the timetable in time, the whole school does! How well do you deal with difficult situations? Being a manager isn’t just about recruitment, timetabling and developing your team. You might face problems with teachers who are unprofessional or unsuitable, and you can’t avoid it by keeping your head in the sand until they go away. Instead, you need to confront the situation by finding out exactly what is causing the problem and then decide on a suitable course of action in conjunction with the teacher. It’s important to remember that very few people deliberately act in a negative way. They normally don’t realize that what they are doing is a problem, or if they do they may not have the appropriate strategies to deal with it. It is rarely a question of them as a person, and more a question of their behaviour. Think carefully about how you speak to people when you are in a difficult situation. Can you remain balanced and neutral, focusing on behaviour instead of personality? If not, perhaps management is not for you. What do you do if you make a mistake? However competent you are and however much experience you have, there will come a day when you make a mistake. The way that you deal with these mistakes will shape the impression your managers and team have of you. Remain calm and offer solutions and they will respect you and want to continue working with you. Panic, and trust will be lost. Beating yourself up about mistakes will also lead to more stress for you, in what is probably already a stressful job. Remember that nobody can be perfect all of the time. Can you maintain a healthy work-life balance? While you will probably never really escape the job and thoughts of it will always be at the back of your mind, if you find it difficult to have a life outside work you are probably not going to be able to work to the best of your abilities. It’s important to have methods of escaping from the pressures of your job, and to have a group of friends outside work who you can spend time with, particularly if there are difficult situations going on at school. This will help you to let off steam in a controlled way, without impacting on your relationships with the people you work with. Are you willing to reflect on your experience? Reflecting as a manager starts with considering the people you have worked for in the past. Who were the best and worst of them? Why? Which of them are you most similar to? Which skills and techniques can you steal from them to fill in gaps in your own abilities? It doesn’t stop there though. As with teaching, the only way to become a better manager is to reflect on what is and isn’t working. By doing this, you will be able to spot areas you can work on to improve and become more useful to your team and your organisation. Do you still want to do this? After considering all of these questions, if you still think you have what it takes, go for it! Managers who are good communicators, who work well with other people, and who are willing to admit to their mistakes and deal with them in a professional way are exactly what help to build effective organisations. Good luck with making the move! Sandy has just started work as the Director of Studies at IH Bydgoszcz in Poland. She was previously the DoS at IH Sevastopol, a much smaller school. She is hoping that she asked the right questions of herself before she agreed to do take on this much bigger task! She will be blogging about her experience at http://sandymillin.wordpress.com. You can tell her what questions she missed by tweeting her @sandymillin.